0 Comments Published by KL Ocs Kid on Saturday, February 9, 2008 at 11:05 PM. Rafa Benitez admits time is running out for Liverpool as they chase a place in next season's UEFA Champions League. Liverpool face Chelsea at Stamford Bridge on Sunday, a match which can be seen live on Sky Sports 1, and Reds boss Benitez is targeting a rare victory in West London. The Reds had been touted as genuine title challengers this year, but they now face a battle with the likes of Everton, Aston Villa, Manchester City and Portsmouth just to finish in the top four. And under-pressure Benitez acknowledges that his side must start to find some consistency in the race to reach a place in Europe's top club competition. 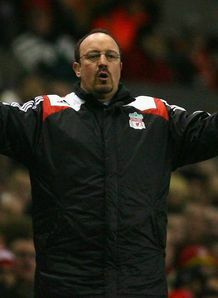 "We are fighting for fourth position and if we beat Chelsea we can maybe think about third," Benitez said in the Daily Star. "But if we don't we are running out of games. I've said it many times, but we need to start taking our chances more often. "If we get three points at Chelsea, in terms of confidence it will be good for the team. "I know we have not won at Stamford Bridge in recent seasons, but nobody is winning there so it is not just for us that it is difficult, it is difficult for everyone who goes there."